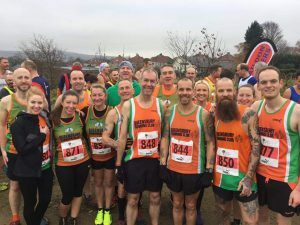 A big thanks to Baildon for hosting the 1st race of this years series, a well marshalled and well organised event, well done to you all. With the league switching to a season pass system a record number of runners turned up to race, so at 10.30am on mild winters morning 479 runners lined up on the start line waiting for Steve Boyer to give the off. With things a tad congested to start with the 1st half mile was spent trying too stretch the crowds out enabling runners to find their momentum and get into their stride. A hilly and sometimes technical course meant full concentration was required at all times to avoid any nasty falls (nobody told me). QRC performed well with the Ladies finishing 3rd overall and the Super Vets 1st overall on the day.